Overstatement is never a good thing. He's talking about college professors video recording lectures, superimposing their faces over a digital whiteboard or powerpoint slides, embedding quick quizzes to check for understanding, and giving regular tests for students to demonstrate their learning. NOTHING else has more potential to lift more people out of poverty? I recently finished my first MOOC, using the Coursera platform mentioned by Friedman in his article. The course, Drugs and the Brain was offered through Cal Tech. I thought it might give me a little more credibility in writing about the value of MOOCs, and as a Psychology teacher I wanted to learn more about the biology behind the interactions between drugs and the brain. Overall, I would rate my experience as quite positive. 1)I had an opportunity to learn for free from a very accomplished instructor through a prestigious University. 2) While I could have probably found most of the information shared somewhere on the internet, having an instructor narrow the focus and give it meaningful direction added an efficiency to the process that made it possible. 3) With two jobs, three children, and a terrible writing habit, finding the time to leave home for three to five hours a week to sit in on a class is not an option. This course was accessible. 4) Related to the third, this course was for personal and professional growth. I wasn't interested in showing full mastery or the capacity to continue a course of study or move forward in a sequence. I was able to casually devote whatever time I wished to sacrifice without the "de-motivator" of no credit or a bad grade. I accomplished my goal through this course. I can't explain much of what I learned, and truthfully, I still don't understand some of it. But, when I teach my students about neurons in the brain and how chemicals in the body function, I can do so with a little more clarity and understanding of my own. I am more confident with the level of material that I'm supposed to know than before I took this class. But does it really have the potential to "unlock a billion more brains to solve the worlds problems." My experience wasn't all that. 1) The first two weeks were so far over my head, I learned very little. I was able to take the quizzes a first time and return to the class notes with more focused study for a second or third attempt. This process of quizzing, studying, and requizzing helped me learn a bit more. From the discussion threads, I gather that many in the course considered this cheating. I considered this, but as a consumer, I took the course with a different purpose than finding out how high I could rank among other students. But this presents a clear problem with the platform-- how will it measure student learning in a fair way considering many of the courses have thousands of students enrolled. 2) Other than accessibility and convenience, there is little difference in the instruction from a traditional college course. It involved lectures and testing. The instructor was good, but even in a room with other humans, lecture without interaction is tedious. The topics were delivered in 5-15 minute segments, but still accounted to hours a week of lecture. By week three, I resorted to setting the playback speed to 1.5x and 2.0x by week four, slowing down for items of interest or pausing for better understanding. Week five was the most relevant topic for my learning goals, but other commitments that week led me to skimming over the lecture slides and giving the quiz a shot without watching the lectures. I do plan to go back and watch them, but this doesn't look much different than typical behavior in a traditional setting. 3) The course instructor notes in comments on Friedman's article that they plan to award 4400 statements of completion and remarks that the online community has generated more than 5000 postings. Over a five week course that averages to 1000/week. I considered participating in this community, but the number of people and volume of posts were overwhelming. 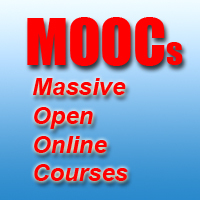 The serious difference in MOOCs, and other forms of online courses shows itself the most here. In the half-dozen or so other online courses that I've taken, I've been a part of a community of 8-30 people, expected to interact with each other. 4) Finally, I found it easier to "compensate" for what I didn't know than to put the effort into learning it. I ignored formulas and calculations throughout the course because they involved skills that I either didn't possess or hadn't used in several decades. I knew it would take a little time to brush up and figure out how to do it, but I also knew that the cost of not learning would be minimal and I wouldn't find myself needing it in the future anyway. I would rather end on a positive note than a negative about my MOOC experience. The only reason I bring up the negatives is to place a little reality check on the praise. There is a place for MOOCs in the world of education. They provide a valuable service that cannot be provided any other way in our current world. I am enrolled in two more courses through Coursera for this calendar year and look forward to them. But, they aren't going to save the world. Maybe they'll make a boot shaped dent that's better than nothing, but they won't replace education as we know it. And if we think they will, and try to make it happen sooner rather than later by not supporting public preK through college education appropriately, we might find that our adventure in MOOCs could have the opposite of the rosy effect Mr. Friedman predicts. Since the early 1990's (perhaps before, but I wasn't particularly concerned before then) both state and federal politicians have been calling for measures to "hold teachers more accountable." Most of their ideas have lacked creativity and instead of searching for true measures of accountability, have searched for efficient and scaleable ways to sort the good from the bad. Instead of rich, multi-dimensional measures of accountability, we get mechanized testing. Students corralled into auditoriums, gymnasiums, any available classroom in front of computer screens for several hours a day over a two to three week period taking mostly multiple choice tests. Schools and teachers are then judged on the results. Schools must go through great efforts to make sure that every child sits for a test. If they don't for any reason, it counts against the school. Testing coordinators must track down transfer students who've moved from out of state or who've failed tests in other Virginia districts to take the tests. If they do poorly, the school is accountable even if they haven't provided the instruction. Students only need to pass a set number of tests to graduate. If they've met this requirement, they still must take the additional tests. Their performance doesn't affect them, but again, it will count for the school. Schools have had informal methods of accountability for decades. Whenever I give a grade to a student, or make a decision about their instruction I am accountable to a student, parents, and administrators at all levels. From A-F, my class policies are clearly defined and in print year after year. From time to time, a student or parent will ask for an explanation while a term is in progress or after a grade is received. I am answerable to them, and on more than one occasion in my career, that answer has not been acceptable. Then it moves up a level. Those conversations are difficult and uncomfortable, but usually lead to growth. Sometimes a parent is left dissatisfied and angry. Sometimes the teacher is left unsupported and frustrated at having to make a change. Usually a compromise is reached, both sides having a chance to dialogue with each other, and future actions informed by the outcome. I can understand that what I described above doesn't always work so well. Some parents are not empowered to advocate so well for their child and some schools are not so inclined to responsiveness. But accountability should belong to the very individuals most influenced and invested in a given action. We're moving in the direction of making teachers accountable to the influence of corporate standard setters, test makers, and data gatherers. We can create a better system of accountability. It's not as easy as giving a test and applying a score, but the informal systems of accountability like what is outlined above could become more formal through policy. It would also place accountability into the hands of the ones who deserve it the most. "UVa set to launch global classrooms"
Now there has to be something remarkable in this article to warrant putting education as the lead right? Wrong. It is arguable that the University of Virginia is behind the times a bit in launching its digital presence and many theorize that contributed to the failed ouster of Teresa Sullivan this past summer by the Board of Visitors lead by Helen Dragas. The efforts to improve in this area led to a partnership between Coursera and UVa as they offer MOOCs(Massive Online Open Courses). This particular article features World History teacher Phillip Zelikow and his efforts to provide a World History Course using this approach. Zelikow and the author laud the new approach of flipping the classroom. New huh? There is nothing new about much of this. It is merely a reflection of the shifting political winds. 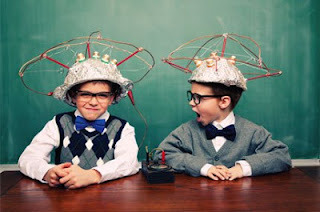 For starters the wondrous fascination with online education and technology leads to a false sense that technology infused education is automatically better. They are blinded to the fact that it may simply be a lecture on a computer rather than in person. The idea that the campus walls are being knocked down is intoxicating. But UVa doesn't stand out for this type of this nor am I thinking it should try. Certainly the access by the masses to skills and knowledge is a piece very attractive to many. But so is Google. Can the result of a MOOC on the participant be described as "an education?" Is this effort more valuable for UVa to go global or for the participants? I have taken several MOOCs and some were good, some were not. One was even through UVa. What usually made the difference was if I was able to interact with the instructor. If you do not have access to an actual person to enrich your learning, what does that say about quality? My feeling is that a real education starts when you are born and mostly comes from interactions with real life people. There is a whole lot more going on that just the conveyance of information or content. Learning is a two way street despite what the commercials at the University of Phoenix would have you believe. The MOOCs I've taken helped me but only to the degree necessary. They did their job. There are many shortfalls with MOOCs not the least of which is the way they are pushed and marketed. The intoxication with flipping is even worse. Nevermind "flipping" a classroom to those of us in the basement meant sneaking into a classroom and literally turning all the desks upside down. This oft repeated buzzword seems to seduce reformers and they immediately conclude this is the "panacea". The magic bullet. I can't escape the irony that this "flipping" (and the paper uses quotes too) is all too normal. It usually amounts to a taped lecture and then making the students do what would have previously been homework in class. In some cases that is an improvement and the teacher who can be replaced by a computer deserves to be. It is one of many best practices. But we must not forget that a good education involves a teacher, a student and an rich variety of methods. None that are worthwhile should be sacrificed for expediency or cost. There are trade offs with flipping. In high schools for instance having 8 teachers "flip" on you might mean you are now saddled with a hours of instructional videos amounting to more homework. The door may be open to individual attention in class and more student centered strategies but at what cost to the student? The fluid nature of piecing together information replaced with uniform and robotic information. It seems in our rush to improve the status quo in education we are willing to look beyond the flaws of any given approach and promote it simply because of the novelty or the price. Zelikow and UVa are doing a good thing. But anyone who believes this will amount to some increase in quality or experience for most enrolled is probably mistaken. The real benefit is the ability of Zelikow to then do more small group discussion during the actual class. As we change the face of education we must not overlook the fact that it still needs to resemble a face. After reading his piece it would seem to me that Douglass Rucskoff of CNN would agree that we should not make distance learning, MOOCs or similar reform into it something they are not. I remember 15 or so years ago doing my student teaching and supervising a latin class where the students learned via satellite network. They watched broadcast lessons, submitted their papers by mail and waited weeks for feedback. Their boredom and frustration was painfully obvious. Not so much with the delay but with the isolated feel and absence of a relationship with a knowledgeable teacher. They were stuck with me. Devoid spontaneity their learning suffered. This and their multi-tasking meant there was no way they learned as much as the students present with the teacher. But they did have the chance to take Latin which counts for something. So Progress has been made I suppose. And in the years since we have traded satellite feeds for high speed internet. The change is noticeably unremarkable. Unwilling to accept the realities of the human mind and learning we continue to search for "better" ways to learn. The result is an over-willingness to see such measures as headline worthy. When in fact they are just worthy. I commend UVa and Zellikow for their efforts. But I stop short of buying this approach as anything but less than what students in his current class might experience. Flipping and MOOCs and what they are. Not headlines. And not real progress. After a 6 month investigation, te TU discovered this photo of how state governors develop their own unique education reform agendas. The newest testing approach pushed by ALEC may have pushed some youngsters over the edge. At exactly 88 mph, young Arne Duncan's twin disappeared. It was then he realized he had made a terrible miscalculation. In the week that President Obama's announced twenty-three new executive orders regarding gun control in the wake of the Newton school shooting tragedy, the nation is gripped by two news stories of scandal from the world of sports. Lance Armstrong admits (maybe) to using performance enhancing drugs, and news of the touching story of the death of the girlfriend of former Heisman hopeful Manti Te'o of the storied Notre Dame football program turns out to be a hoax. If you don't know the story, here it is from the news source that broke it, Deadspin.com. What? Deadspin.com. Since September, this story, crafted into an inspirational story of loss and hope has been perpetrated by media from sports outlets like Sports Illustrated and ESPN to broader outlets such as CBS and CNN. Long story short, Manti Te'o began sharing a story about losing his grandmother and girlfriend within hours of each other, making his team's quest for an undefeated season even more meaningful. It turns out the girlfriend was a fiction. Maybe he knew, maybe he was the victim of a hoax. In either case, the public is a victim of careless media. We write about education, so what does this story matter? A piece on the Atlantic analyzed this story and ended with this line "If you want to trick someone, lie to them. If you want to fool someone, tell them what they want to hear." How is it possible in the information age, that so many media outlets failed to take the simple step of checking public records or inquiring a little deeper into the veracity of a story? It is troubling that only an largely unrecognized internet outlet would take the trouble to do so. In trying to research information for this blog, it is increasingly evident that media outlets are "receivers" of the news more than "investigators" of the news. Governments and institutions employ media relations people to create and craft the stories they want to be told. Newspapers and television reporters regurgitate what they're told and sell it to the public as truth, often lacking any depth or critical analysis in their reporting. This is why even when PBS teams up with TED to "talk education" we get Bill Gates, Ken Robinson, and Geoffrey Canada as the exemplars of what's wrong and what's right in education. They give us a story we want to hear, words we want to be true for everyone. This Teach For America gets exaggerated claims of success without anyone caring about the numerous failures. It's why the media can call the approach of Khan academy "online learning on steroids" without anyone saying, "what makes it substantially different than a lecture?" Increasingly, a one-dimensional and inadequate narrative of the story of public education is sold to the public and we lack the strong journalistic media to check all claims and facts to present all sides of a story. Instead of looking for the primary sources and roots of information which is often difficult to find and hard summarize, they take what they're told, pass it along, and move on to the next item. The misleading story of Manti Te'o's girlfriend is unfortunate, but could have been prevented if news outlets would have simply tried a few searches of public databases and independently verified sources. Instead, they simply passed on what they'd been told. "We must embrace a culture of innovation and accountability by adopting proven reforms"
The last two years in Virginia have seen calls for limiting continuing contract status for teachers (similar to tenure), changing dismissal policies to make it easier to fire teachers, and increases in accountability measures to make sure that schools and teachers are doing a good job. 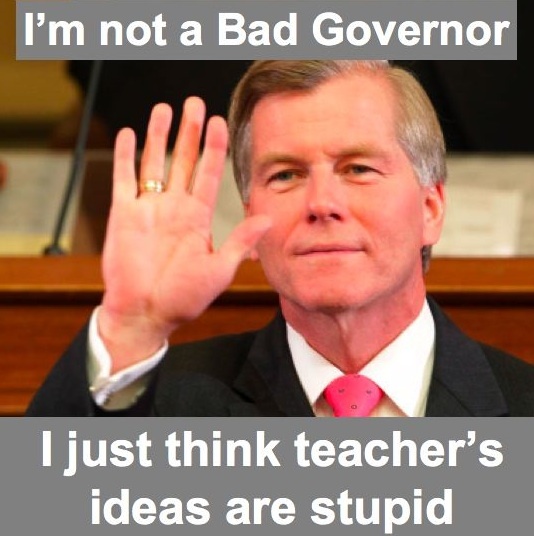 Governor Bob McDonnell is a strong supporter of teacher and school accountability. Apparently not so much for leadership accountability. The Southern Association of Colleges and Schools is one of six regional accrediting organizations recognized by the U.S. Department of Education. K-12 public schools and colleges in eleven states receive accreditation from SACS. They are a recognized and legitimate source of accountability for institutions. This organization issued an official Warning to the University of Virginia for non-compliance with it's standards. A warning that if not addressed could lead to loss of accreditation. This warning had nothing to do with academic quality at the University. The warning applies solely with leadership of the institution, specifically, minority control of the board and decision-making. This warning is a direct result of the Board of Visitors actions last summer in dismissing President Teresa Sullivan. How did the Governor hold the Rector of the UVA Board of Visitors accountable for leading the board down this improper path? He reappointed her to the position. How is the Virginia Legislature holding her accountable for her actions? They're moving forward with approving her nomination to the Board. Don't pretend to care about accountability if you're only interested in accountability for some. Maybe if teachers contributed more to political campaigns we'd get better treatment? In response to the resignation and subsequent reinstatement of President Teresa A. Sullivan, SACSCOC required that the University document compliance with three principles – Principle 1.1 (Integrity), Core Requirement 2.2 (Governing Board), and Comprehensive Standard 3.7.5 (Faculty Role in Governance). After reviewing the response from the University’s Board of Visitors, the Board of Trustees of SACSCOC found the University non-compliant with Core Requirement 2.2 and Comprehensive Standard 3.7.5. In a recent press conference after the announcement, the president of SACSCOC cited concerns related to minority control of the board (Core Requirement 2.2) and policies surrounding faculty role in governance (Comprehensive Standard 3.7.5). Virginia Governor Bob McDonnell has released his full legislative agenda for k-12 public education over the last two months, culminating in his State of the Commonwealth address on January 9. While his agenda carries some valuable changes for education in the Commonwealth, much of his plan appears to be under the influence of a consistent national reform movement that we often speak out against in the Teaching Underground. In response to the Governor's proposal, we'd like to offer several "planks" in our own education reform agenda that would serve to strengthen public education in our state. 1) We hear much about "all children, regardless of their zip code" deserving an excellent education. This implies that we consistently have some schools or districts that fail. Explicitly it means that certain schools or districts fail to consistently meet target scores on standardized testing. It doesn't take deep research to look at demographic groups in Virginia that are failing according to these measures. In defense of a plan to create different pass rates for racial groups as a part of the NCLB waiver State Superintendent Patricia Wright stated "we have to consider that students start at different points." We contend that the reason children in a given zip code consistently fall short is only due in part to sub-par schools. Many factors in a given zip code impact the "starting point" of large groups of students. We must have a zero tolerance policy for failing schools. Therefore, I’m asking you to approve a bold initiative to establish a statewide Opportunity Educational Institution to provide a high quality education alternative for children attending any chronically underperforming public elementary or secondary school. The Opportunity Educational Institution will be a new statewide school division to turnaround failing schools. If a school is consistently failing, the Opportunity Educational Institution will step in to manage it. If the school has failed for two years, the Institution can take it over and provide a brand new approach to a broken system. Failing schools are not an option. But before we label them failures, we need to put more resources into pre-K intervention strategies and wrap around services to make sure that before we judge schools' effectiveness we're certain that they're being judged fairly in comparison to others. Some schools have to turn volunteers away, have no concerns about availability of books and technology in the home. The education received in school complements the education received in the home and doesn't substitute for an enriched environment. They say that teachers want to blame the students for their failures, but we're getting very close to blaming teachers for the failures of a society that refuses to do the hard work of making sure that every student enters school on an equal playing field. 2) We continue to hear the narrative that all we need in under-performing schools are better teachers.The governor proposes that Virginia take part in the Teach for America program. He admits that we have a "very small sub-set of Virginia schools that are failing" but seems to doubt that we have the talent among qualified teachers to make a difference. Teach for America is not the solution. First, the state should determine if a shortage of teachers actually exists in the state. Second, if schools are truly hard-to-staff, perhaps we should identify what factors make them so hard to staff. Poor pay, lack of support, lack of resources? Certainly we're up to the challenge in the Commonwealth of making our schools places that students, teachers, and a community want to belong instead of "outsourcing" our children's education to a fluid cadre of teachers with five weeks of training and a two year commitment. Perhaps a "teach for Virginia" corps made of the state's most recent ed school graduates would be more in order. 3) Throughout the governor's agenda, the focus rests on measuring output and responding to failure. Since the advent of Standards of Learning testing in Virginia, this has been the narrative. We start with the assumption that things are bad and then pour our resources into proving it. Part three of our plan would involve providing time and resources to school systems to build and ensure quality instead of a single method approach of measuring output. We argue that currently so much of our time and resources are being devoted to the measures of output it decreases the quality of our input. Create a clear policy for parents to opt students out of standardized testing if they are satisfied that their child's classroom performance adequately measures their achievement. This plan would allow parents to become more involved in their child's education and force schools to take a more transparent approach to instruction. Parents could continue to allow children to take standardized tests in order to objectively measure student progress if desired, but for students who have clearly exceeded standards it would free up time and resources for other activities. 5) We realize that large numbers of students opting out of testing would create one problem. Currently, the same tests used to measure student achievement also measure school and teacher quality. Student achievement certainly correlates positively with teacher and school quality, but one measurement can't accurately measure both. We need to more specifically identify and differentiate the measurements of student achievement and teacher/school quality. We can't be afraid to admit that the students of two different teachers are very likely to show different levels of achievement even if those teachers are of the same quality. As long as we purport to measure student achievement and educational quality in a single undifferentiated measure, we inadequately measuring both. Hopefully, enough Virginians (and more importantly our legislators) are familiar enough with the consistent messages of the national reform movement to recognize the similarities and identify the shortcomings of this proposed direction of change. We're not in favor of status quo, certainly we need some change in education. It is doubtful our ideas above will make it much further than our brains, but one can only hope. Yesterday, The Atlantic posted an article by Joel Klein titled "The Case for a Teacher Bar Exam." On one hand he argues that American teachers are not valued as professionals and we need to make greater efforts at doing so. But, he seems to imply that teachers are not treated as professionals because they aren't. One solution- give them a test to enter the profession. That seems to be the answer to everything in education today. Personally, I'd say if taking a test will lead to higher pay, better benefits and more respect, bring it on. Tests don't bother me in the least. I made it through elementary school in the highest leveled classes because even though I didn't like to do work, every year I finished above the 90th percentile on those old "SRA" tests that we used to take. In middle school and high school, I didn't have to spend much time on homework and still stayed in honor's level classes because as long as I paid a little attention in class the tests were never that difficult. I only took the SATs once because I got a high enough score to get into the college of my choice. At college, things were a little harder. Some classes were graded on multiple choice and short answer type tests. But others actually expected me to engage in discussion, right papers, and participate in activities. That nearly killed me academically. I actually had to work, learn, and apply knowledge instead of just convincing someone through a test that I was competent. I took the National Teacher Exam early, before even enrolling in education school just to get it out of the way. I found a review book and studied for a few days and earned the passing score on my first try. GREs weren't much harder. If you create a test for teachers I promise I'll finish in the top ten percent. But it won't have much to do with how well I teach my students. Klein's error is the classic field of dreams. If you build it they will come. He looks to teachers of Finland who come from the top of their university classes, who enter a competitive profession. From my point of view I would argue that treating teachers more professionally- raising salary, providing autonomy, etc.,- would lead to greater professionalism. Klein believes that increasing professionalism- testing teachers, increasing accountability, etc.,- will make the teaching profession more respectable. Both views are one dimensional and flawed. There must be a middle ground. There are areas in which teacher preparation and accountability must be raised, but adding requirements and restrictions is not the way to either encourage the "best and brightest" to join our ranks nor to encourage the competent teachers already in the classroom to stay. Um...Not so much. Our school New Year begins in August and we will return to work this week immersed in the tail end of the first semester . Exams are staring us all in the face and usually the first day back after the holidays is anything but happy. You may have noticed our inactivity...or maybe you could at least pretend you noticed...so we will have to do something about that. A good starting point might be to touch on a few things that have been going on the past two weeks while we ate too much and slept in just a bit. A-F SCHOOL REPORT CARDS - proposes to simplify the current school accountability system to an easy to understand A-F grading system. STAFFING FLEXIBILITY FOR SCHOOL DIVISIONS - provides flexibility for school divisions to assign staff to schools with particular needs and areas of focus, rather than blanket mandates. There's a lot more meat on the bone but no time to go into detail. Some is good...some is bad. Not huge fans of the TFA idea. And job security is about the only decent actual job benefit and that appears to be on the way out. How about taking some cash and funding a earnest effort at statewide Pre-K program. Just a thought? OH WAIT...we can't forget that the governor supports at least a discussion of other staff carrying guns at school. Right now we have a complete ban which I think the TU is fine with. Securing schools is a big deal. Watch The Education of Michelle Rhee Preview on PBS. See more from FRONTLINE. I had to resize this object from its orginal "666" width. Coincidence? 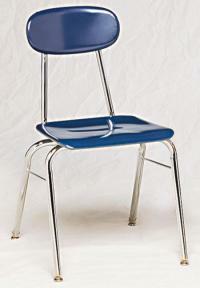 We went through some of this at the start of the year but one little discussed topic...furniture. The Model #144 remains the king in most places. And what's the deal with this? I have no problem with #'s 1-5. Those are all tough and stressful jobs...But...#s 6-10? Seriously? Who the heck made this list? Pointing out the obvious, teacher is notably absent, as are any other job I've ever done. But come on now I am pretty sure I could name about two dozen jobs more stressful than Photojournalist. Not that I am trying to offend any of my photojournalist friends. Welcome to the New year Folks. We can only hope it will prove far less interesting that 2013.